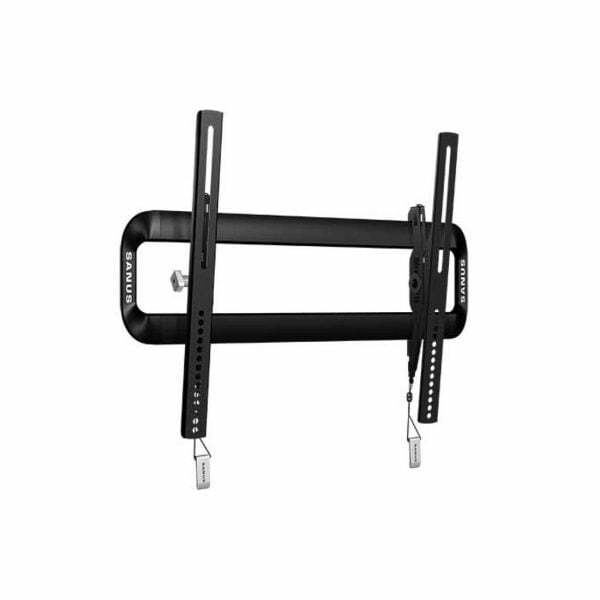 SKU: VMT5B3 Category: TV Wall Mounts larger than 42"
Sanus VMT5-B3 Tilt wall mount for TVs Premium Series. It’s features fingertip control so you can easily adjust the tilt without tools. The mount can support TVs with screen sizes from 40″ to 50″ and weighing up to 75 lbs. The Sanus Premium Series VMT5 tilting mount gives you the best view of your wall-mounted television from the floor or couch. You’ll be able to tilt your TV from -7° to + 12° in order to give you a better viewing angle of your wall-mounted TV; tension knobs tighten the bracket in place. Tilting the TV also provides easier access to cable connections on back of the television. The Sanus Premium Series VMT5 wall-mount bracket is designed to support flat-panel TVs from 40″ to 50″, weight up to 75 lbs. The VMT5 tilting wall-mount bracket accommodates a horizontal hole spacing on back of the TV of 100mm-500mm and a vertical hole spacing of 100mm-400mm. The Sanus VMT5 comes with M4, M5, M6, and M8 size bolts of differing lengths to mount the bracket to your TV.